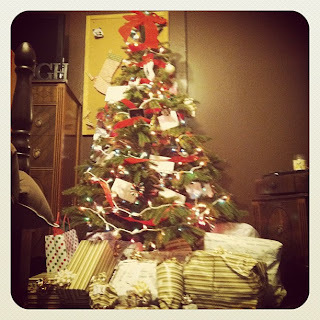 I finally finished wrapping all of my gifts today. I have a few more to finish making, but all of the other gifts I had in bags everywhere are now wrapped. My favorite part is how they are all in coordinating gold and beige wrapping paper with bows. I can't wait to see everyone open their gifts. I get stuff all year round from people and Christmas is the one time I can really return the favor. I actually got too many gifts for a few people on my list because everything I see reminds me of them. 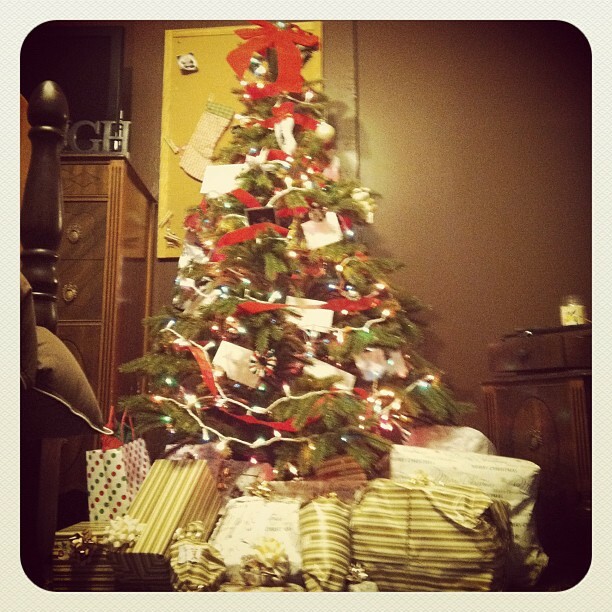 This is also the fullest my little tree has ever been. Now I get to sit back and enjoy how perfect it looks. Today was the first Christmas Party on our huge list of family parties. We went to my Grandma's house where Santa actually comes and visits. He literally calls everyone up and gifts them gifts out of his big red bag and asks them what they want for Christmas. My brother, Alec and I basically just tried to watch the whole event from the other room, but we eventually got called up by Santa for gifts and pictures. Santa gave me a gas card this year, woo! This is the best picture we have because in one picture I am moving and the other one both Santa's and Alec's eyes are closed. Maybe next year we will get a good, solid picture with Santa. Amy and I did this last week but, I have not got around to posting about it until now. 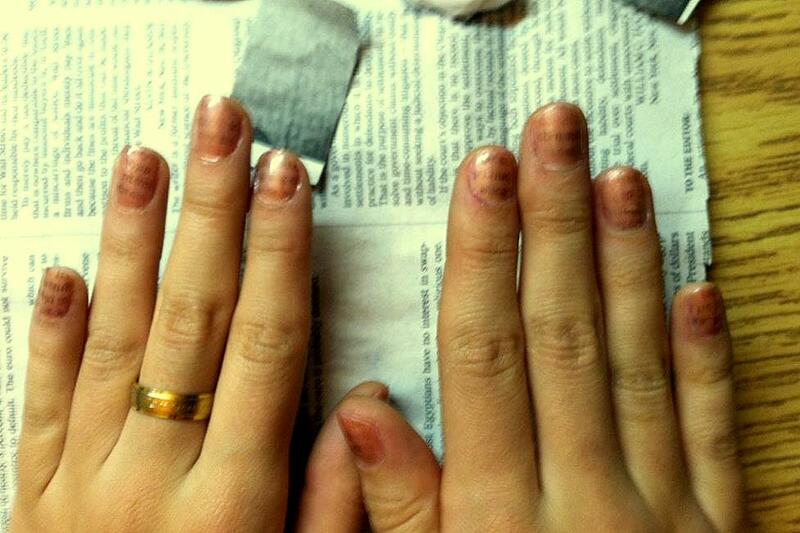 We newspaper printed our nails and it turned out really cool. It is so easy and looks great afterwords. This photo below does not show the text very well, but shows how mine turned out. The photo above is just one I googled to show the text better. First, paint you nails the color you want them. Then, cut out a bunch of little squares of newspaper big enough to cover your entire finger. Take a cotton ball that is soaked with rubbing alcohol and rub it on your finger nail. This can also be done by dipping your finger into a dish of rubbing alcohol but, we did it with a cotton ball. It essentially does not matter how you apply the alcohol, you could even use vodka for your alcohol, just get it on your nail. 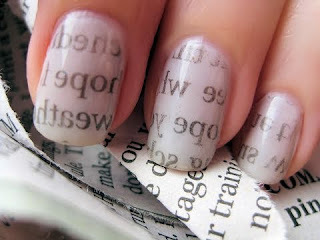 Next, set a piece of text on your finger and press it on the nail, being careful not to smudge it. Cover the paper with the cotton ball with alcohol on it for 15-20 seconds. Carefully peel off the newspaper. When they are dry, add a coat of clear coat nail polish to protect and brighten the text. Also, I have not been posting about sewing for a while now. I have been getting a lot of sewing done but, can't post about it until after Christmas because it is a gift! I also have been cross stitching but, that post is for the future,too. I hope everyone spends lots of time with their family, eats their full of delicious Holiday foods and enjoys the season! The process for these nails takes me right back to my childhood and applying temporary tattoos!